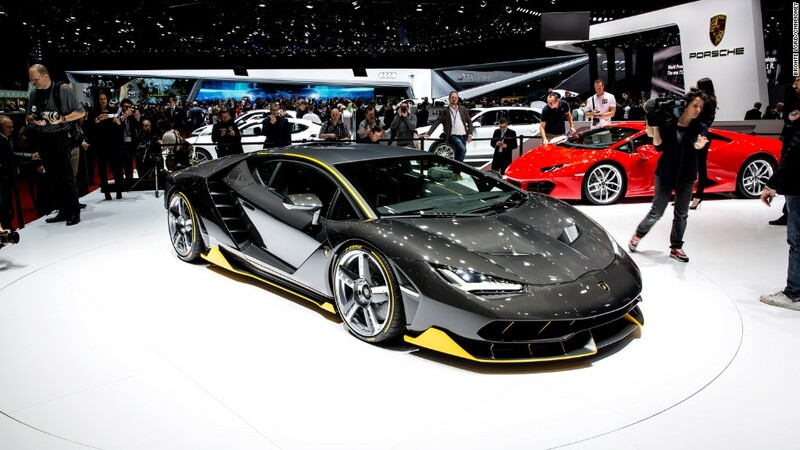 We've seen in it already in supercars like the Ferrari LaFerrari, McLaren P1 and Porsche 918, machines that offer high tech thrills for those with bank accounts that could re-float failing nations. Lower down on the cost scale, there is the new Acura NSX. With prices starting at just under $160,000, it's like a supercar that's imaginable, at least for those with smaller inheritances. 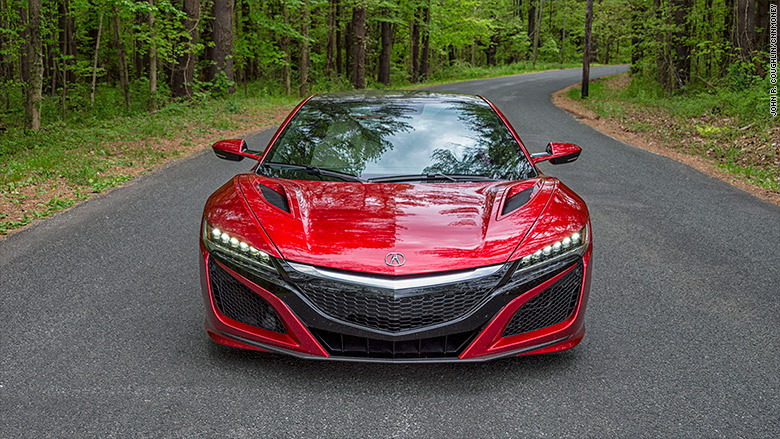 Engineers at Honda (HMC), Acura's parent company, combined a turbocharged V6 engine behind the seats and three electric motors -- one providing additional power for the rear wheels and one more powering each front wheel -- for a total of 573 precisely targeted horsepower. It can go from zero to 60 in under three seconds and has a top speed of over 190 miles an hour. Clearly, fuel economy is not the first order of business here but, given all that, EPA estimates of 22 miles per gallon on the highway and 21 in the city are reasonably impressive. I could feel all that technology, including the independently powered front wheels, at work on the famous Lime Rock racetrack in Connecticut. At first, the Acura engineer riding along had to remind me not to brake so much ahead of sharp curves. The car could handle a much faster corner than I probably thought, he said. Despite speeds that were substantially into triple digits, there was nothing approaching fear. Still, it was enormous fun to rip through curve after curve without ever feeling like I might need the crash helmet I was wearing. 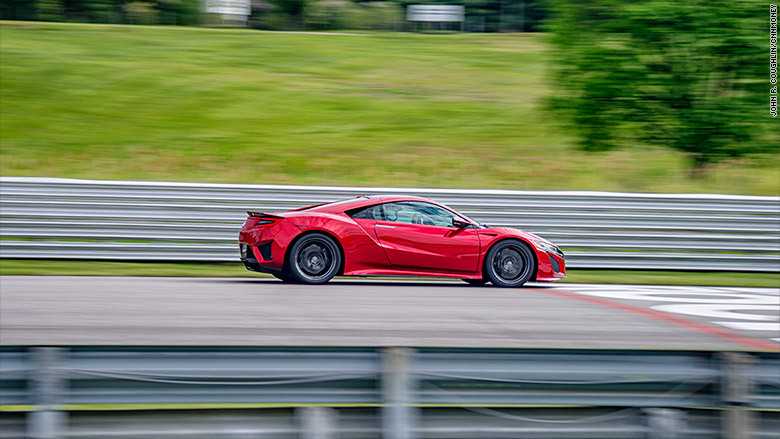 After a few laps, driving the NSX at mind-bending speeds became weirdly calming, even with the sound track of that V6 engine hitting high notes behind my head. All this was done in the NSX's "Track" mode. 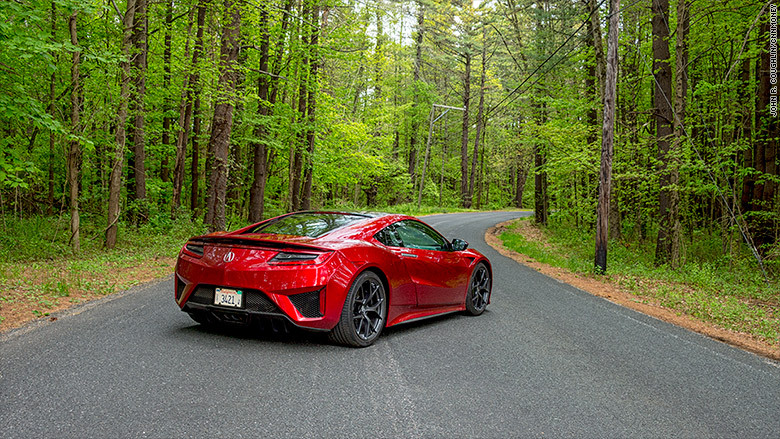 Later I took it out on Connecticut's country roads to get a feel for other programmed driving modes -- Sport, Sport+, and Quiet -- which can be selected by fiddling with a knob. If you really don't want to hear the engine at all, you can choose "Quiet" and cruise along on mostly electrical power delivered through the front wheels. It is, in its own way, very neat. "Sport" is the mode that I -- and, I think, most NSX owners -- would spend the most time in. Quick rushes of power are doled out with a notable roar from the engine. I must say, though, that my one real disappointment is that engine sound. It's not the aggressive ripping sound of a Ferrari V12 nor is it the throaty burble of a big American V8, nor even the fun popping of a juiced up four-cylinder. Instead, this engine sounds like... just a loud engine. Perhaps I'm being picky, but the NSX's V6 needs some voice training to coax a out little more emotion. Sport+ just cranks things up a bit more. The steering quickens and the suspension stiffens making for even more excitement on nice, pothole-free country roads. 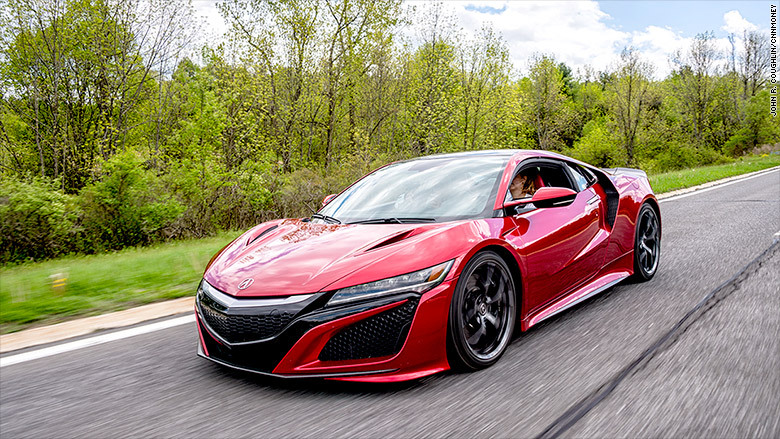 The Acura NSX is a fun but very livable sort of supercar. On the open road, it provides plenty of thrills but without ever being, in the slightest, intimidating. All the technological juggling -- gasoline power to electricity and back -- entertains the brain as well as well as the heart. It's the smart man's supercar at a (relatively) bargain price.